Did I just read all of that in a tiny little book? I'm stunned. I can't believe what I've just experienced. I thought I'd be able to read it right away but life got in the way. It sat on my desk unabashedly, and quietly waited for me to pick it up and read just one page. So I finally got a chance on this stormy night and opened to the first page. One sitting. That's all it took to read 134 pages of page-flipping anxiety and tension mounting to see what would happen next. It would have been criminal of me to take a break and deprive myself of reading it all at once. I could not put it down. Val is a young black woman who has just entered into college, and Bud is an older white man in his seventies -- quite an odd friendship that they develop from one afternoon at a coffee shop because of unexpected events. Bud has an ability to know things, and Val has her own special abilities. A connection between the two is born and the ultimate inevitability of fate begins to play its incredibly twisted game. What choices would you make if you could see the future? What about the ability to move stuff physically without touching it? How would you use that power? Is it a gift? I cannot in good conscience tell you any further details or events about this story because it would destroy the opportunity to experience this firsthand and to flip the pages as I did. Suffice it to say that there is the slight chance that there might be some readers that get a tad...uncomfortable in a few sections, but isn't that what happens when you mess with fate and then maybe have to do a little backpedaling to adjust? The writing was absolutely fantastic, one chapter flowing to another with such an ease that is missing in most highly promoted and publicized books. The subject matter and events experienced by Val and Bud are astonishing, comforting, and extraordinary. To be quite honest, I'm stunned that there isn't more of a scramble to read this incredibly creative book and discover the twisted little maze of life's game. This is a powerhouse story in a tiny little book that packs more jaw-dropping moments and speechless intensity than some overly promoted books from large publishing houses. I'm waiting for this little story to take the world by storm. 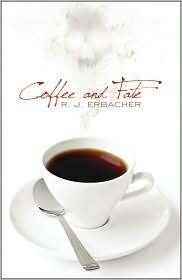 R.J. Erbacher has created a calculated and gripping account of what happens when sometimes, you screw around with fate, and sometimes, when you can't. That's right. I want another person to receive my author's copy even thought it pains me to part with it. All you have to do is: Enter a comment below with your email address. Then read the book when you get it and tell people what you think. That's it. Entries from comments accepted through Friday, November 5, 2010. Winner announced Saturday, November 6, 2010. FTC Disclosure: Thanks to the author for sending me a copy of his book. I am a follower . I would love to enter if this is International. Thanks! Would love to read this. If it's international, throw my name in the hat too! Sounds like such a treat of a book! I would love the enter the giveaway - Thanks! I read a review of this on Sandy's blog, and thought it sounded fabulous. It looks like I was not wrong! It sounds like something I would love. I would love to be entered in your giveaway, and if I am not the winner, I am surely going to buying this book! I think this sounds amazing and like you surprised I haven't seen it around, thanks for wanting to share it with us. I am adding to my Wishlist but will keep fingers crossed to win and share it also. The novel sounds facinating! I'd love to read it and post on it. Put my name in the hat! Sounds like a good read. tediousandbrief (at) gmail. This seems a really good book. I can't believe you are giving it away, which is really generous of you. I'm "international" (aren't we all?, but I mean, not from the North American continent). I've added this contest to Book Contest Directory! Sounds awesome! Would love to read it. Sounds fantastic. I am a follower and I hope I win!! I would love to enter! Nice giveaway. THANKS. Wow, I just found your blog and what a great review for me to start with. How could I not go for it. Wow this book sounds incredibly powerful! What a fantastic find! No, I have never heard of this one before but now I want to read it. Your review was excellent and did it's job. Got the word out and makes me want to read it. thanks for the contest and if I win I will read it and pass it along as well. Great review! Definitely going to add this to my to-read list. I want to find out what their special abilities are! :) Thanks for the post. This sounds fabulous...I'd love to read it. i love the sound of this one! your blog is the second one i visited tonight, and i'm excited for ANOTHER rave review of a book. even if i don't win, i would like to pick this one up. thank you for the review and giveaway! "To be quite honest, I'm stunned that there isn't more of a scramble to read this incredibly creative book and discover the twisted little maze of life's game." THIS one went straight to my to-buy list on Goodreads! The other reviewer there states the same thing, so if I don't win, I'm getting it anyway! Thanks for the giveaway! If I am not too late, please throw my name in! ah man i just missed entering! I'm going to have to find me a copy of this book... it sounds wonderfully delicious! Thanks to everyone for entering!! This is definitely a keeper of a book, in my opinion!